Pricing based on team order of 12 uniforms or more. Call now for individual uniforms pricing! 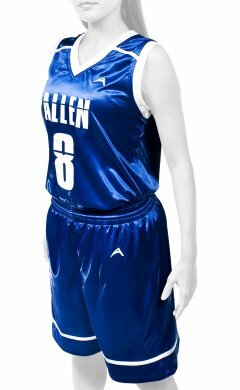 Allen Sportswear offers a number of options in women's basketball uniforms. The variety of color combinations that are available are fitting for a number of schools and organizations. The basketball uniforms can be customized, as there are 7 jersey neck styles to choose from and up to a 7 trim pattern range. For instance, the jerseys can have a high v-neck, which gives the uniform a sporty but feminine touch; low or high U-neck styles are available as well. The shorts for the uniform fall just above the knee and are loose-fitting, making them easy to move in. All women's basketball uniforms are made from 100% knitted polyester fabric. The breathable nature of the fabric helps to keep players' body temperatures regulated during a game. Arm and neck ribbing for the uniforms can be customized in up to three colors. Two colors can be chosen to customize the name and number that appears on the jersey. Paneling for the uniforms can also come in a variety of patterns that include the team colors. If the team has not yet chosen their logo and font, Allen Sportswear gives coaches and administrators the chance to create women's basketball uniforms from scratch on the website. The logo can feature a pair or series of letters, along with coordinating fonts for jersey numbers. Customers can see a sample of the finished product before purchasing the jerseys. 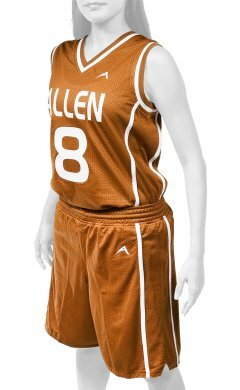 Additional sports fashion items that go well with women's basketball uniforms, such as socks or sports caps, are also available at Allen Sportswear. These items can make a basketball uniform complete and are an attractive addition to team warm-up suits. The online store offers training bags to store uniforms, sports equipment and compression t-shirts as well. Customer feedback is visible on the Allen Sportswear website to give potential customers an idea of the quality products they'll receive from the company. Allen Sportswear also offers the option of a free quote, based on the number of uniforms that are needed. Customers can receive the quote online or by calling Allen Sportswear at 407-641-4900. Customers can also call to order uniforms at 1-877-MY-ALLEN.